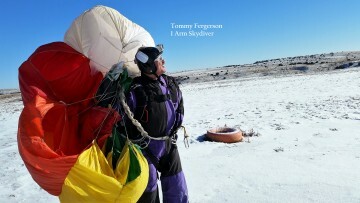 Tommy Fergerson had a skydiving accident in which he broke eight bones on his left side including three in his foot, a rib, wrist, clavicle (collar bone), scapula (shoulder blade), and coracoid process (bone that keeps shoulder in the socket). He took eight stitches across his right eye after his helmet gouged into his eyebrow. But worst of all, was an avulsion of his brachial plexus (a series of nerves that move his fingers, hand, arm, shoulder, and pectoral muscle) from his spinal cord from C5-T1 that later required his left arm to be amputated. Because he was between insurance coverages; yet, needed the amputation to prevent infection, Tommy was overwhelmed. How do I continue to provide for my family? Where can I find a vascular surgeon to perform the amputation without health insurance? Where can I come up with the $60,000 to $80,000 to cover the cost? How do I live my active life with the new challenges put before me due to limb loss? Tommy was able to rise above all the obstacles, thanks to his faith and support from his family and friends. He has not let the amputation of his arm interfere with his passion for an exhilarating and fulfilling life. He has pioneered methods to ensure that he is able to continue living life to the fullest. Tommy is the first one-arm skydiver in the world to jump without a prosthetic and he continues to be an accomplished skydiver, mountain climber, kayaker, swimmer and skier. We need your help TODAY to ensure that people stop feeling helpless and overwhelmed following a life-altering event. Clasp Life will help find the resources and equipment needed so can they keep their passion and independence. Get involved. Become part of the solution. Tommy Fergerson had a skydiving accident in which he broke eight bones on his left side including three in his foot, a rib, wrist, clavicle (collar bone), scapula (shoulder blade), and coracoid process (bone that keeps shoulder in the socket). "What The Freak Did I Hit Clasp Life,"